Spanish Rafal Nadal will take on Russian Mikhail Youzhny in a quarter final match of Doha Cup today. 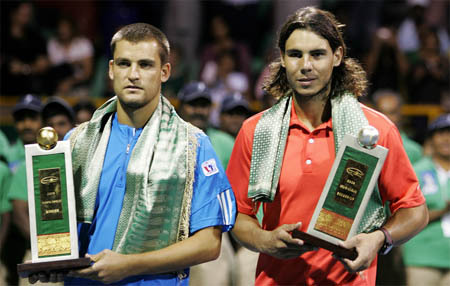 Youzhny defeated Karlovic in the second round 6-2,6-7,6-3 in order to face Nadal in the quarter finals. "I'm happy about how my return has worked the two days here and how a few things have worked well with the new weight of the racquet. I'm starting to have good feelings." Match will commence at 16:30 GMT, live from Doha, Qatar.